Plunger Velocity Sensor - Extreme Telematics Corp.
We’re happy to announce the release of the long-awaited plunger velocity sensor, Sasquatch. Sasquatch is the first plunger lift sensor specifically designed to protect the artificial lift system, known as plunger lift, from dangerous high velocity impacts. The technology of the Sasquatch is built on the foundation of our plunger arrival sensor Cyclops. Sasquatch not only detects the arrival of the plunger, but also measures and stores the instantaneous surface velocity of the plunger. 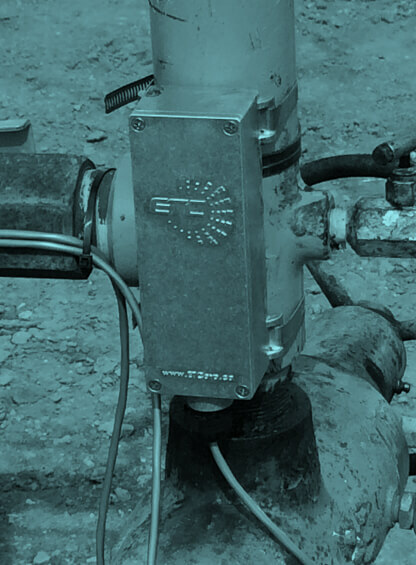 The power of the Sasquatch sensor resides in its ability to not only proactively alleviate potential health, safety and environmental catastrophes, but to also reduce overall plunger lift operating costs. This leads to a more transparent and safe plunger well operation that will optimize production. Sasquatch is certified for safe use in Class I, Zone 2 (Div 2) hazardous locations, with a rugged design to sustain extreme cold and hot temperatures. Sasquatch operates reliably from -40°C to +70°C (-40°F to +160°F), and includes the ability to adjust sensitivity for total accuracy with a wide variety of plungers and surface equipment. Sasquatch is now available for presale. Please contact your preferred ETC reseller for more information.